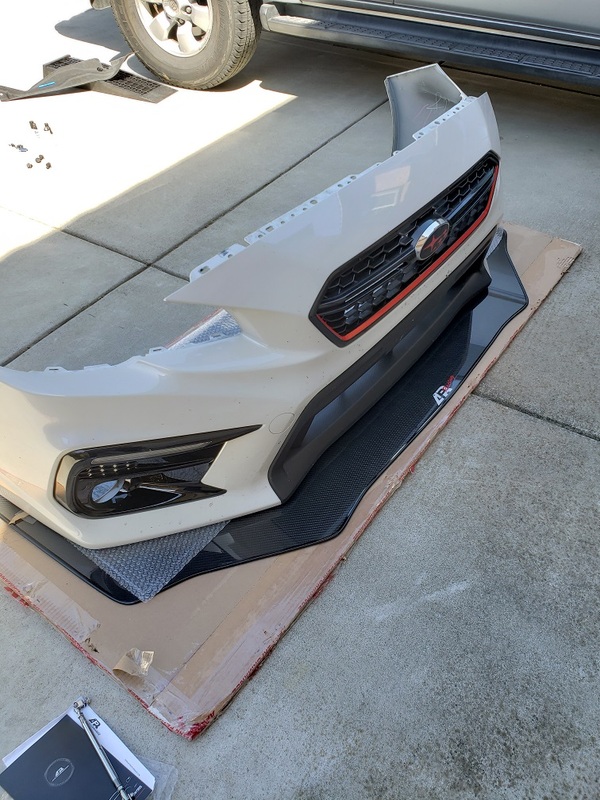 I've just attempted to install a APR Performance front splitter and it's not going smoothly. My biggest problem right now is that there isn't enough clearance underneath the engine bay, and this is after gutting out the mug guards and skid plate. 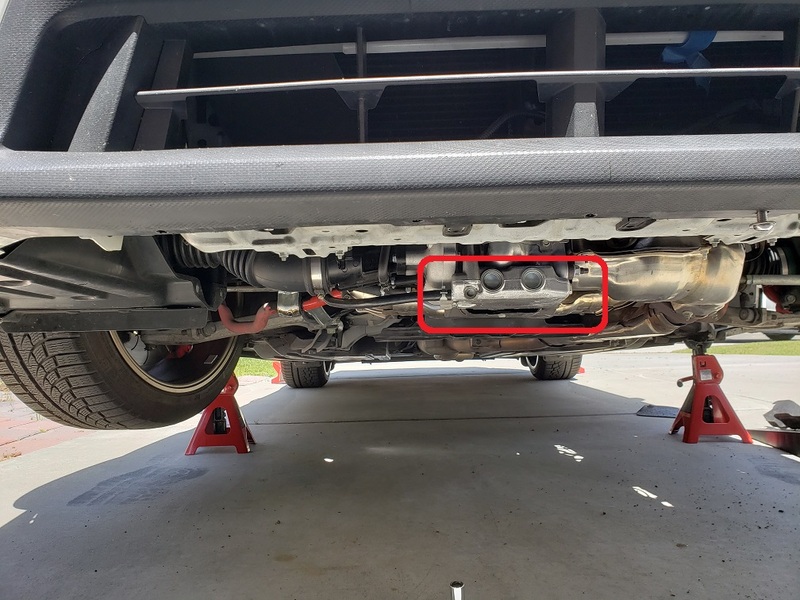 Some of the splitter area that extends further is touching one of the components (not sure what part that is, but it's connected to the downpipe. Turbo?). I'm going to assume this part and area runs very hot because it's right next to the DP. Would this burn the carbon fiber splitter? How can I rectify this without choppipng up this portion of the splitter? Is this a design flaw from APR Performance? that engine part in red is what's touching the splitter. This is the turbo? This is the skid plate and splash guards that I had to remove for the splitter to even have a chance of fitting. 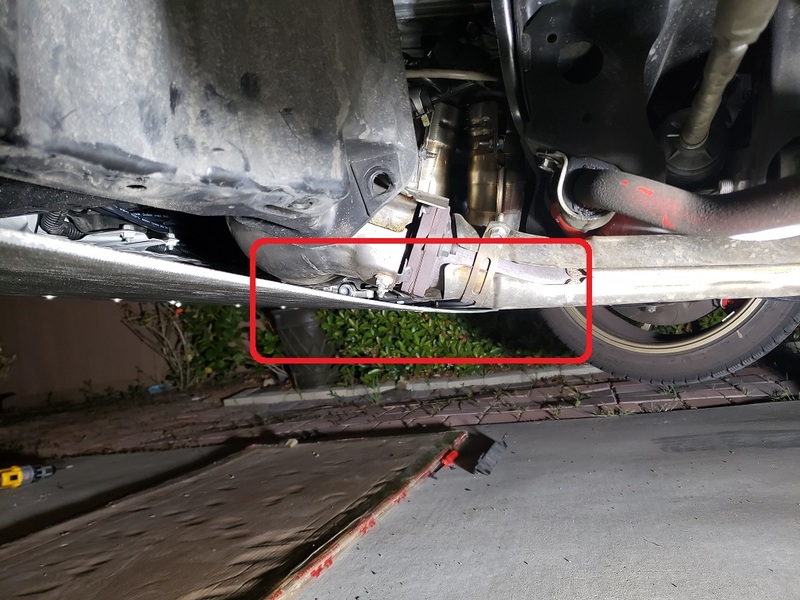 Is it ok to drive around without a skid plate? 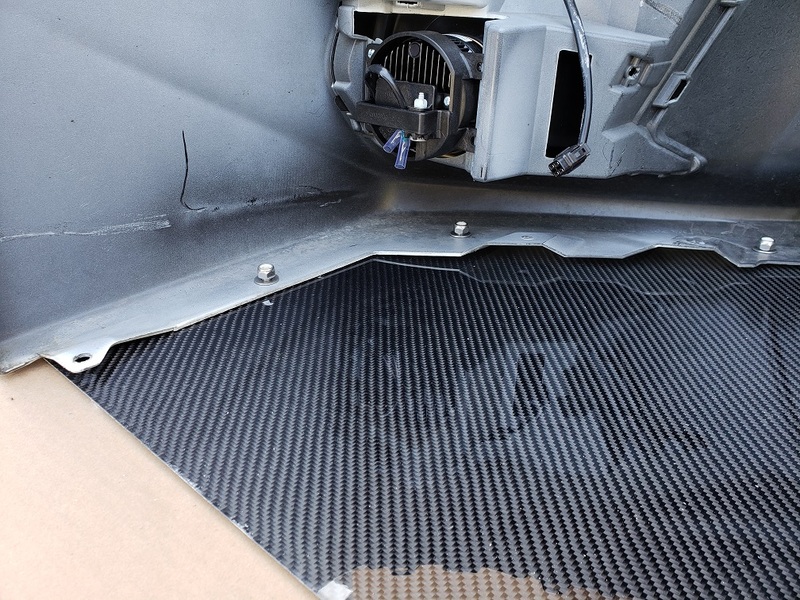 Would my engine not sufficiently cool because the front splitter blocks airflow underneath? 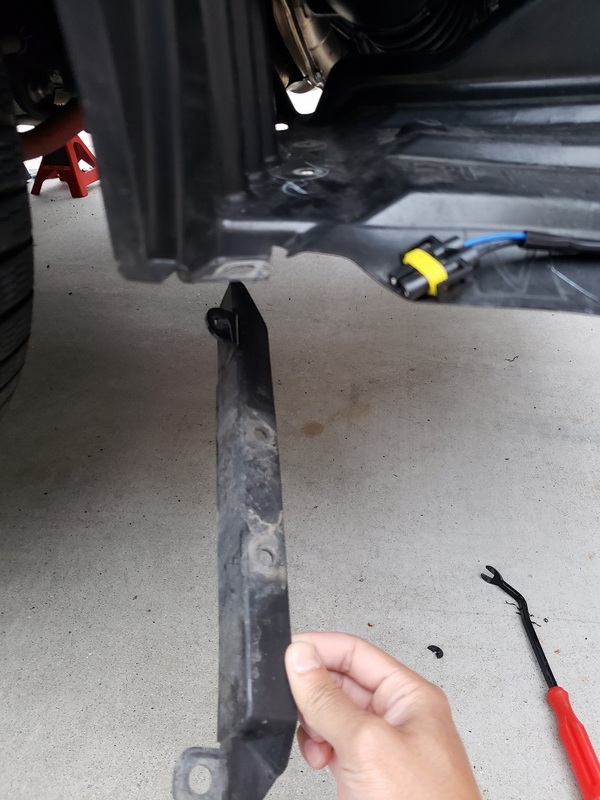 The splitter bolted onto my bumper. Is this secure enough that it won't rip out? Any other suggestions or comments appreciated! BTW here is the splitter. You can see that they somehow installed directly on the bumper without the front lip. that's your turbo sump btw. i would keep the skid plate. maybe you have to cut the splitter around it. all that cf looks awesome. keep us posted. Maybe someone who has already installed the splitter can shine in. But from the looks of most splitters out there, it seems as if it replaces both the skid plate and splash guard. There are rocks, pebbles, debris, etc. On the road and i don't know how well carbon fiber will hold up to the impact. Good luck with the install and hopefully everything goes well. 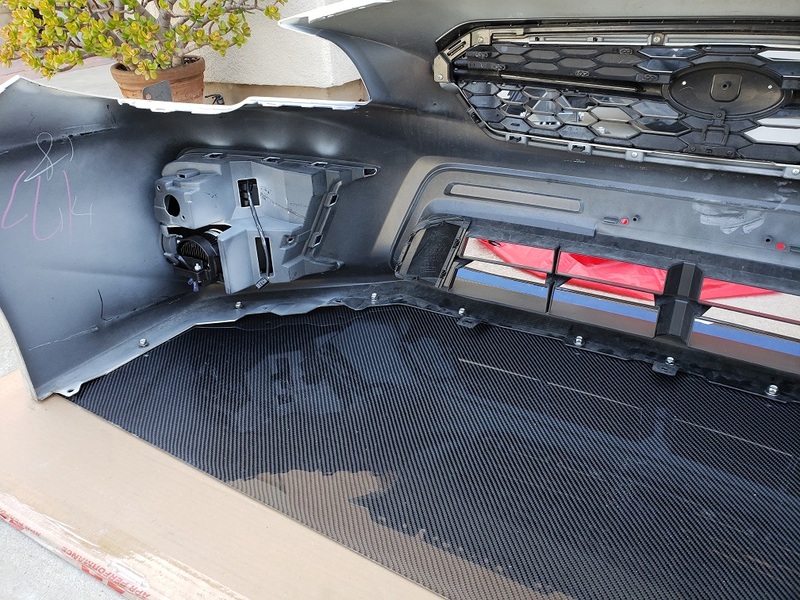 Btw, APR makes quality product, i don't think you need to cut anything if its specifically for your car. This is one of the few splitters that is a whole board, extending all the way back. most splitters out there is more of an "arc" that gets mounted to the bumper rather than cover up the whole middle and goes back that far. I also emailed APR to see what advice they have. Right now my car is still on jack stands pending this install. So I managed to get it installed, but not 100% happy because the turbo is slighly pushing down on the splitter. 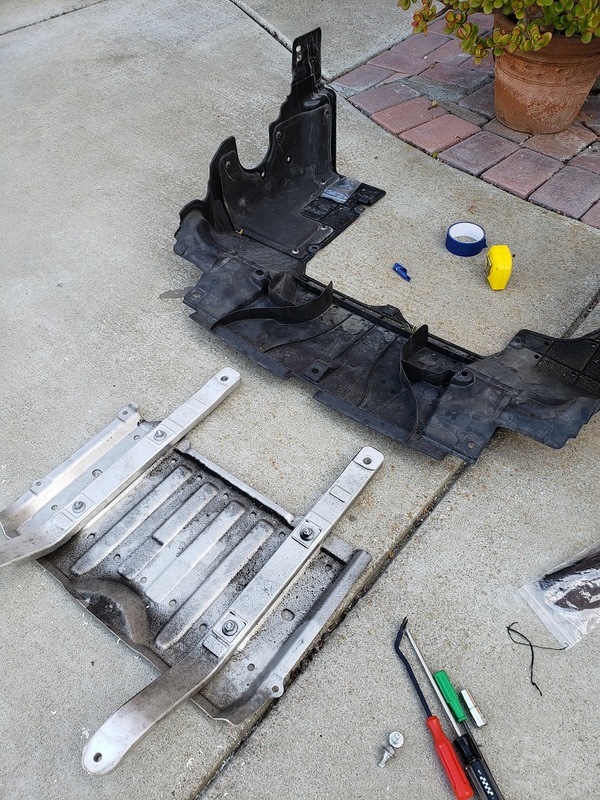 I'm not comfortable with the hottest part of the car and splitter touching, and also had to gut out the skid plate, splash guard, front wheel flaps for it all to fit. I had to permanently drill out these front wheel flaps because they interfered with the clearance of splitter. After everything is mounted to my car. You can see the turbo touching the splitter, and also slightly bending it down. When all said and done, here's what it looks like. Throw a front lip on there in between the bumper and splitter and it looks as though that will give you the clearance you need to get under the turbo. Probably not the answer you were looking for but without hacking up the new splitter I don't see how you get around the clearance issues otherwise. Seems like a lot of work to get fitted only to expose your turbo to potential damage. It looks okay, but it's definitely form over function. It kind of sounds like you realize this but don't want to admit it? 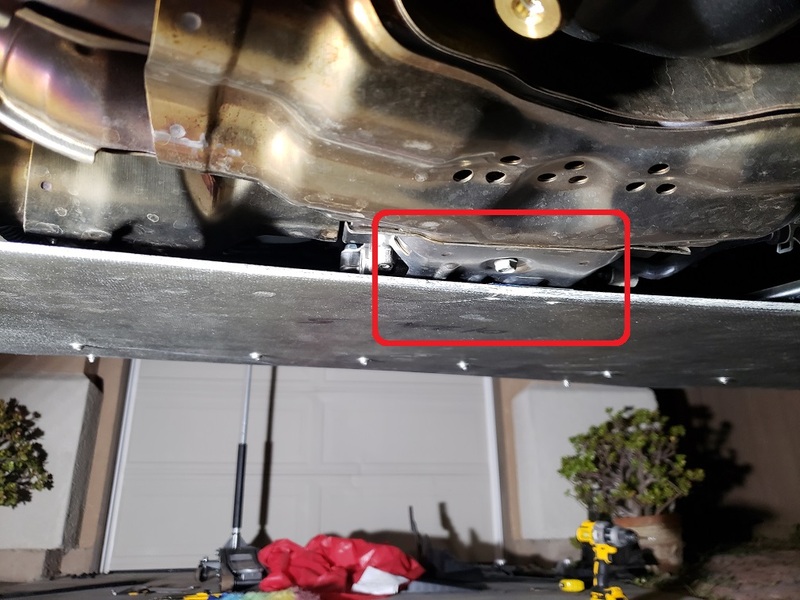 If you're making payments on this car and can't afford to replace the turbo than maybe the skid plate should go back on? Not trying to be mean, just seen expensive cars ruined by bad modifications too many times. As Turpid Porpoise stated above usually you would mount this under a lip or air dam. When your car is on level ground is your splitter level? If your splitter has more ground clearance at the front than the rear you will make the car handle worse at speed. You don't want your splitter packing air under the car, it should be ran level or slightly higher in the rear than the front. 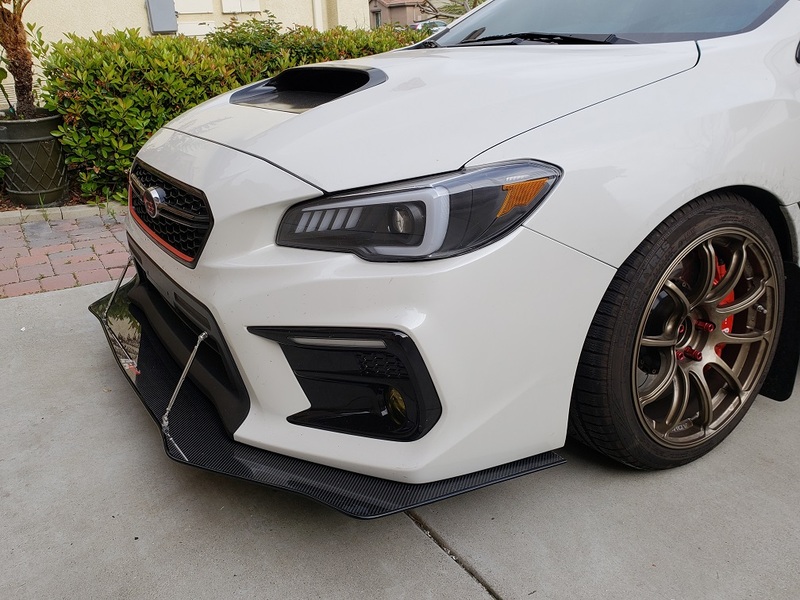 Even with the replica lip on my 2015 sti I had a 1 inch gap to fill to level out my splitter. Finally mounting should take into account what you expect to do. Last weekend I was at the track doing 120+, my splitter is chasis mounted using a steel frame. I plan to rebuild it using steel rod and heim joints. If you plan to track your set up I would look into chassis mounting. https://professionalawesome.com has good info to look at. The heat shield for my stock headers sit about 2 inches from my splitter. I have not seen any heat damage through multiple years of abuse. However sealing the bottom of the car really messed up cooling on my car. On the wrx I don't know if it is an issue. It's for decoration anyway, so why not just cut the part you can't see (part that's under the engine).